I am pretty crap at most DIY tasks, and would rather pay for someone who knows implicitly what they are doing -- but there's this really nifty new book that might switch my line of thinking. 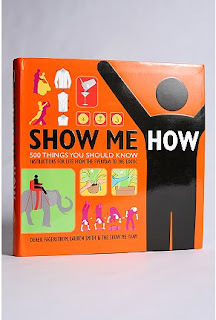 'Show Me How: 500 Things You Should Know' by Derek Fagerstrom and Lauren Smith is a helpful reference book depicting via glorious colour illustrations how easy it is to complete many important (and some wacky) tasks. Want to brush your dog's teeth? Open a champagne bottle? Perform CPR, or breathe fire? 'Show Me How' will, well.... show you how! And in a fun way....none of that boring instructional manual blandness. Just keep the fire department's number on speed dial in case you decide to undertake the fire breathing lesson.